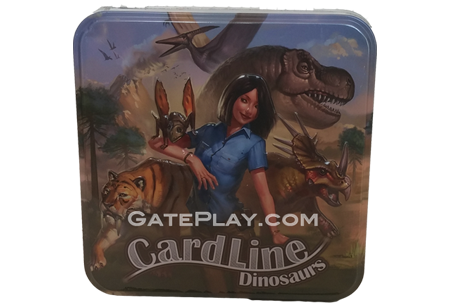 Drake says: "Cardline: Dinosaures is similar to Cardline: Animals — but with dinosaurs! It is a card game played with approximately 100 cards." At the start of the game, each player places a number of dinosaur cards on the table in front of her with the characteristics hidden. One card is placed in the center of the table with its characteristics revealed. Players then take turns placing a card from their tableau in a row on the table; a player can place a card between any two other cards. After placing the card, the player reveals the characteristics on it. If the card was placed correctly – that is, with the particular characteristic in numerical order compared to all other cards on the table – the card stays in place; otherwise the card is removed from play and the player takes another card from the deck and adds it to her tableau. The first player to get rid of all her cards by placing them correctly wins. 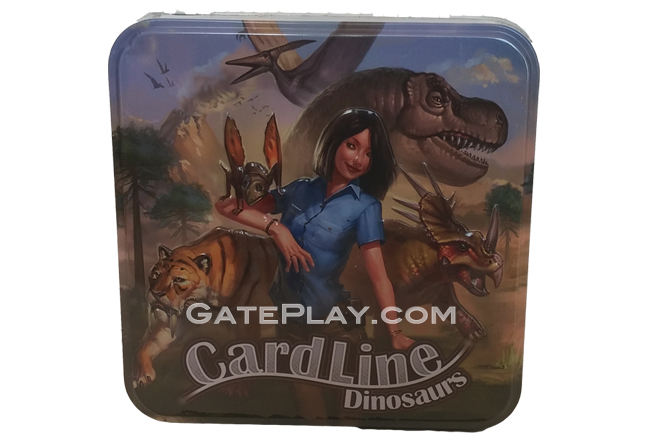 Check out "Cardline: Dinosaurs" on BoardGameGeek.com!